Releasing a freshly-tagged monarch butterfly. Photo by Arlene Koziol. Bring your whole family and join us at Goose Pond Sanctuary to help with conservation efforts to track declining populations of monarch butterflies. Madison Audubon works with monarchwatch.org to capture and tag butterflies at our Goose Pond Sanctuary for monitoring efforts throughout their migration route. You can help with this important citizen science effort! According to the US Fish and Wildlife Service, the recognizable orange-and-black butterfly species is in trouble. "Threats, including loss of milkweed habitat needed to lay their eggs and for their caterpillars to eat, are having a devastating impact on their populations and the migration phenomenon. Unless we act now to help the Monarch, this amazing animal could disappear in our lifetime. The state of Monarchs reflects the health of the American landscape and its pollinators. Monarch declines are symptomatic of environmental problems that also pose risks to food production, the spectacular natural places that help define our national identity, and our own health. 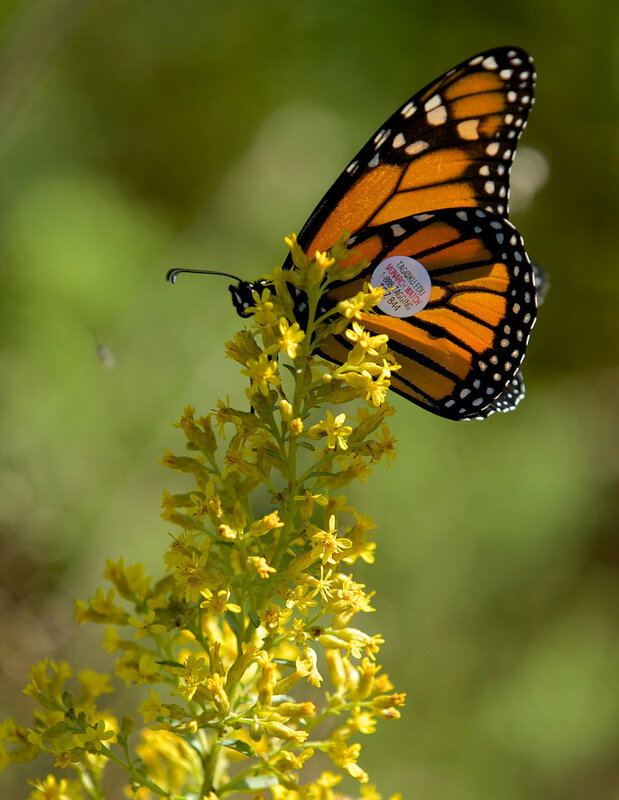 Conserving and connecting habitat for monarchs will benefit many other plants and animals, including critical insect and avian pollinators, and future generations of Americans." Attend a tagging event at Goose Pond on September 3rd or 10th to help with this important effort. Please register! We will be unable to support additional trip attendees due to limited materials and impact on the land.